Our passion for enhancing the health of individuals in need inspires us to offer only the best care services for our clients. 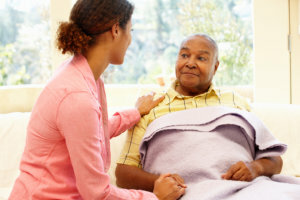 Our mission is to enrich the quality of life for our clients and provide exceptional in-home care services to seniors, the disabled, or anyone requiring compassionate, caring living assistance while remaining in the comforts of their home. We are passionate about the care and support we provide to our clients and families. We are deeply committed to providing honest, safe, comfortable, and trustworthy services to all of our clients. Precious Time has a solid reputation and is a respected in-home care agency. With a shared vision, our founders started the company with the intent of providing ethical and exceptional home care services in Warren, Michigan, and that is exactly what we do. As an in-home care provider, our goal is to be the “Best” in Home Care by delivering professional caregivers who truly understand the value of human interaction and communication, and exhibit above average care. With our caregivers’ sincere gift for caring for others, it allows them to assist your loved one while maintaining their dignity and pride in the comfort of their home. Our healthcare professionals provide support for you and your loved ones, whatever the situation. Because your well-being is the foundation of our business, we perform an extensive and thorough background screening that includes employment verification, driving record verification, and criminal history investigation. Our healthcare professionals are insured and bonded and are available 24/7. Please don’t hesitate to call 586-920-2465 to have your inquiries answered right away.